Aprill Lane of Mansfield, Massachusetts was selected as a $5,000 third prize winner. After seeing a lack of resources for couples encountering infertility, Lane started a small advocacy and support group to talk about her experiences and share them with other couples. That group has blossomed into a nonprofit organization that provides scholarships to couples experiencing infertility. Lane’s selection as a 2015 Myra Kraft Community MVP Award winner drew praise from the AGC Scholarship Foundation. Lane recently wrote a blog entitled “Infertility Inferschmility” and had it published into a book with all proceeds to support the AGC Scholarships. As a result of her efforts and these scholarships, three couples now have children. Lane serves as a strong voice and a beacon of hope to these couples and just a couple of weeks ago, she gave birth to twins. 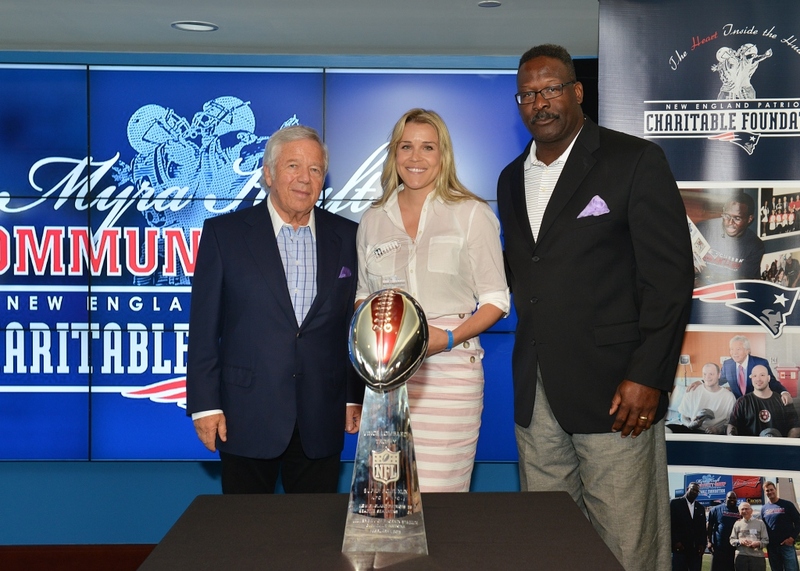 Patriots Chairman and CEO Robert Kraft and Patriots and Pro Football Hall of Famer Andre Tippett congratulate Aprill Lane from the AGC Scholarship Foundation for being selected as a 2015 Myra Kraft Community MVP Award third prize winner. 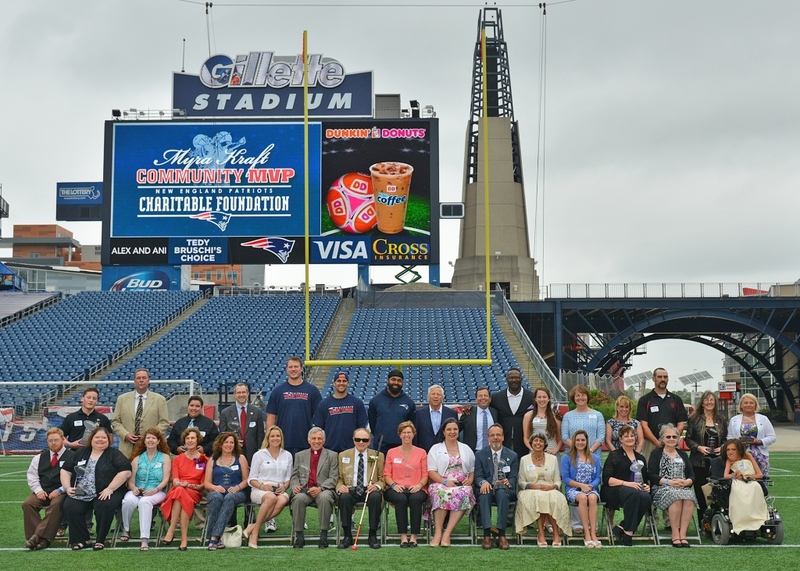 During the June 9 luncheon, the Kraft family and the New England Patriots Charitable Foundation awarded $200,000 in grants to 26 New England nonprofits. The AGC Scholarship Foundation received a $5,000 grant in honor of Lane’s volunteer efforts. Susan Canning Westfield, Mass. KEVS Foundation South Hampton, Mass. Claire Bloom Somersworth, N.H. End 68 Hours of Hunger Somersworth, N.H.
Holly Brown Whitman, Mass. Looking and Feeling FAB, Inc. Whitman, Mass. Robbin Burns-Laubi Westport, Mass. Devin Laubi Foundation Westport, Mass. Michele Dillon Framingham, Mass. Jeff’s Place Children’s Bereavement Center Framingham, Mass. Chaskiesha Figueroa Lawrence, Mass. Beyond Soccer Lawrence, Mass. Robert Glidden, Jr. Proctorsville, Vt. Proctorsville Fire Department Proctorsville, Vt.
Tracy Johnston Scituate, Mass. Scituate CORSE Foundation N. Scituate, Mass. Charlie Lenore West Hartford, Conn. Hartford’s Camp Courant Hartford, Conn. Deirdre Carmody Millones Narragansett, R.I. Domestic Violence Resource Center Wakefield, R.I.
Nonie Bouthilette Florence, Mass. Sibling Connections Somerville, Mass. Suzanne Carter East Dennis, Mass. Flower Angels USA West Dennis, Mass. Ian Clemence-Schreiner N. Woodstock, N.H. New England Disabled Sports Lincoln, N.H.
Brad Cole Milford, Conn. K9 First Responders Milford, Conn.
Hallie Fuchs Fairfield, Conn. Norma F. Pfriem Breast Care Center Bridgeport, Conn.
Aprill Lane Mansfield, Mass. AGC Scholarship Foundation Mansfield, Mass. John Mauro Auburn, Mass. National Ataxia Foundation Auburn, Mass. Macey Miller Newtonville, Mass. Greater Waltham Arc Waltham, Mass. Rebecca Moniz East Greenwich, R.I. Realtor Foundation Rhode Island Warwick, R.I.
Corin Nava Warwick, R.I. Project Sweet Peas Warwick, R.I.
Rev. Dr. Robert Odierna Nashua, N.H. The Front Door Agency Nashua, N.H.
Dana Siegal Stoneham, Mass. Voices of Hope Stoneham, Mass. Alyssa Silva Cumberland, R.I. Working on Walking Cumberland, R.I.